Ursanne Loche's husband is missing! Learn of Ursanne's missing husband. Confront her about this, and she will direct you to the loanshark, Kurdan. Kurdan tells you to go to an island in Niben Bay. When you arrive and speak to Aleron, he informs you it is all a game. Defeat the pursuing hunters, and make it out of the dungeon. Defeat Kurdan, take his key, and get off the island. Return to Ursanne with the news, and receive your reward. A rumor floating around Bravil will tell you that Ursanne Loche's husband Aleron has disappeared. You will need to find Ursanne in order to pursue the matter further. Ursanne will tell you that her husband has racked up a significant debt by gambling. Now, an Orc loan shark named Kurdan gro-Dragol has taken him captive. Speak with Kurdan in The Lonely Suitor Lodge. As long as his disposition with you is 60 or higher, he will tell you that in order to release Ursanne's husband, you must travel to Fort Grief to retrieve an axe. If you agree to go, he will tell you that he has prepared a boat for you to use. The boat is found at the bottom of the wooden steps leading down to the river flowing through Bravil. Step into the boat and activate it to be transported to the island. Using any other sort of transportation (fast travel or swimming) can lead to several bugs. The switch for the gate into Fort Grief is just to the right of the locked gate, on the ground. Inside you will find Aleron, who informs you that he was tricked into coming to look for the axe as well, but it's really a game where you are hunted to the death. At this point, the gate behind you locks and the only way out is to complete the quest, as you may not fast travel while near the fort. Wander through the booby-trapped dungeon collecting the keys from the hunters as you kill them. Once you get back outside, you will see Kurdan killing Aleron. Walk up to Kurdan, and he will explain that he can't let you leave the island alive. Fight and kill Kurdan and his archer friend, Ra'jhera the Keeneye. If you attack Kurdan before talking to him, the archer will not spawn, and as you attacked first this counts for entry into the Dark Brotherhood. Search Kurdan's body for a key. Go back inside the Hunter's Run and use the key on the first gate on your left. This gives you access to a lever which will open up the main exit gate on the outside. Before you leave, be sure to take the two bottles of Shadowbanish Wine that are on the top of the fort to use in a different quest. Return to Bravil and speak to Ursanne Loche again to receive your reward, a copy of Biography of the Wolf Queen, which is a Speechcraft skill book. The boat can be used to quickly transport all of the items you collected to Bravil. Manually carry everything to the boat and pick it up. Even though you are likely over encumbered, you will be able to use the boat to travel to Bravil. Ursanne is not an essential character. If she dies, the quest will be broken at the point where you need to talk to her and the quest marker will point to the place where she died. If you choose to kill Aleron outside of the Fort before collecting all of the keys, Kurdan will appear, allowing you to kill him for his key. If you're having a difficult time defeating the hunters, run towards the hole which makes you fall into the pit of spikes. Jump over it and the hunter following you will keep falling in when they come back up the path to kill you. It is possible to leave the island without killing Kurdan by pickpocketing the key. However, the dialogue will still mention Kurdan being killed. 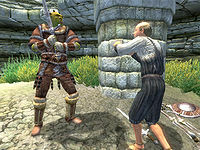 If another NPC steals from Kurdan while he is in Bravil he will attack them, and in turn he may be attacked and killed by guards. His death will fail the quest. Prepare ahead of time by making sure that Aleron is on the lowest level of the ruins before you enter the Hunters Run. The only option is to load from an earlier saved game. This game must be from before the last of Kurdan's three Hunters in the Hunters Run have been killed. Before killing the last hunter, be sure to head outside and push Aleron down to the lowest level of the ruins. Type: enableplayercontrols (This will take you out of cutscene mode, and allow you to attack Kurdan and complete the quest. It is possible to kill Kurdan, search his body, retrieve the key, and open the outer gate without you ever receiving the next quest update and therefore preventing you from finishing the quest. This bug can be triggered if you decide to pickpocket the key off Kurdan before killing him, such as if you kill him with an attack or a spell that makes him fly into the air and then search him before he hits the ground, or are too close to him and retrieve the key from his corpse before the quest updates to stage 80 where it is supposed to inform you of his death. You will need to wait for the journal update where you're asked to search his body for the real key. After this update you can search the body, take the key and you will receive the next update. You can use the Console and type setStage MS08 90 in order to get the next journal entry. Do not lead the hunters further into Hunter's Run when they are found; kill them close to where they are. Otherwise, you may trigger a bug where if either the Imperial or Nord hunter dies near an invisible marker for the next hunter (Nord and Orc respectively) the next hunter will never appear and the quest is broken. You can use the Console and type PRID 1FEED (if the Nord hunter is missing) or PRID 907A5 (if the Orc hunter is missing), and then enable to cause the missing hunter to appear. The first two hunters (Imperial and Nord) have to die for the next hunter to appear; pickpocketing the Hunter's Run keys from them will stall the quest. The quest will, however, update properly and be finishable if the last (Orc) hunter's key is pickpocketed from him. If you fast travel to Fort Grief instead of using the boat and don't go near enough the dock marker to advance the quest, or if Kurdan is killed, Aleron will not be there. If you go into the Hunters Run, you will only encounter one lone Orc hunter; killing him skips the quest to the point where it says you and Aleron should get off of the island. This can lead to multiple issues. If Kurdan is dead, his body will reappear inside Fort Grief after you've killed the lone Orc hunter inside the ruins and retrieved that key. Ursanne will be aware that Aleron has died. However, she will not give you the skill book, and only remarks that she wants to be alone. Fast travel is not properly restored when leaving Fort Grief. If you enter the Hunter's Abyss through the door high on a ledge (usually the way out of the Abyss), you can kill the Orc hunter and receive an update that all three hunters are dead. ? If you are quick enough, you can hit the switch for the gate again and enter the Fort before it closes, leaving it closed with Aleron and you inside the Fort. Speaking with Aleron at this point causes the script which normally closes the gate, to open it instead, thus freeing you both without ever having to enter Hunter's Run. Aleron's scripts don't recognize this, and Aleron will stand there and insist that you must go into the bowels of the ruins and fight the hunters to escape. ? If you've killed Kurdan prematurely, you can become stuck inside the Fort this way, as Aleron won't be there, and fast-travel may still be disabled. The only way out then would be to enter the Hunter's Run as usual. Kurdan's body will subsequently be transported inside the fort as described above, and you can use the key on his body to open the gate from inside the fort as usual. There is a way to leave the island without opening the gate, if you jump towards the outside wall on the highest level of the fort you can initialize fast travel. Sometimes you can get a different, lower-value book as a reward. ? 5 While in Bravil, I've heard that Ursanne Loche's husband, Aleron, is missing. If I wish to help, I should attempt to locate Ursanne and see if I can find out more information. 10 I've met Ursanne Loche in Bravil. She's told me that her husband, Aleron Loche is missing and she needs my help to locate him. I should ask her more about Aleron to help determine if I'm interested in helping. 20 Aleron owed a great deal of money to an Orc usurer named Kurdan gro-Dragol. He went there a day ago to beg for more time, and hasn't returned since. Kurdan gro-Dragol usually frequents The Lonely Suitor Lodge, which is close by. Perhaps I should pay him a visit. 30 Kurdan gro-Dragol has told me that he knows the location of Aleron Loche, and if I want him to reveal it to me, I'll have to retrieve an axe that belonged to his father and was lost on Fort Grief Island some time ago. If I don't bring the axe back, he says that Aleron will die. When I'm ready, I need to speak to Kurdan who will provide a boat for me. 40 Kurdan gro-Dragol told me that the boat is waiting for me at the dock next to the magic shop here in Bravil. I should get underway soon, as I wish to find out what's happened to Aleron. 50 I've arrived at Fort Grief. I should proceed inside the ruined keep and begin my search for the axe. 60 To my surprise, I've come across Aleron Loche inside the ruined keep of Fort Grief! He told me that the search for the axe is a ruse that Kurdan gro-Dragol uses to lure people into the ruins. Apparently, Aleron and I are now the prey in a bizarre hunting sport that Kurdan created. I should talk to Aleron and find out more. 65 If Aleron and I are to survive, I need to proceed down into the Hunter's Run and defeat the hunters being sent after us. According to the "rules", one of them will have the key to unlock the door Kurdan sealed behind us. Since Aleron is in no condition to fight, I'll have to seek these hunters out myself. 70 I've defeated all of the hunters. I should search the body of the Orc Hunter for the key to the keep door of Fort Grief. 75 I've found the key to the door of the keep at Fort Grief. I should now return to Aleron and get us both off this island. 80 I've returned to find Kurdan himself standing over the corpse of Aleron, whom he'd murdered. I had no choice but to attack and slay him. I should search Kurdan's corpse for anything that may help me get out of these ruins. 90 The key I discovered on the Orc Hunter was indeed a fake and the real key was on Kurdan's body. He'd never intended to let us leave whether we won his demented hunt or not. The real key should allow me to unlock the gateroom inside the Hunter's Run and then leave Fort Grief. I will then have to bring Ursanne the sad news. 100 Finishes quest I've told Ursanne about her husband's death. I said that he fought bravely and that his thoughts were with her before he died. She thanked me for my kind words and bestowed a book upon me that belonged to Aleron. I know that I did the best I could, but at least Aleron's death was avenged. 150 Finishes quest One of the characters needed to complete this quest has died. It is possible to use the console to advance through the quest by entering setstage MS08 stage, where stage is the number of the stage you wish to complete. It is not possible to un-complete (i.e. go back) quest stages. See SetStage for more information. Esta página foi modificada pela última vez à(s) 22h25min de 1 de janeiro de 2015.